Well I guess we won’t have to wait till MWC 2014 in Barcelona (which will be happening in less than two week’s time) to see what LG has got to offer, as promised, the South Korean company has just announced its next generation phablet, the LG G Pro 2. As the rumors suggests, the G Pro 2 indeed sports a larger 1080p display measuring at 5.9”. The G Pro 2 is powered by a 2.26GHz Snapdragon 800 processor with 3GB of RAM on board, packs a 13MP rear camera, 2.1MP front shooter, LTE, NFC, 3,200mAh battery, 16/32GB of expandable storage and like the LG G2, the G Pro 2 features the company’s latest design with rear volume and power buttons. Software wise, the G Pro 2 runs on Android 4.4 KitKat with the company’s very own software, bringing the Knock On feature to the device along with a knock-to-unlock feature that allow users to unlock and power up the phone by tapping on the screen in a specific rhythm. Other notable features include a “Flash for Selfie” feature that makes self portraits taken using its front camera come out a lot prettier. Don’t be deceived by its name though, the front camera isn’t equipped with any flash light, instead, the selfie mode will shrink the preview window and give it a white border, giving “better lighting” to the user. As for the rear camera, it also comes with better OIS and can capture in 4K. 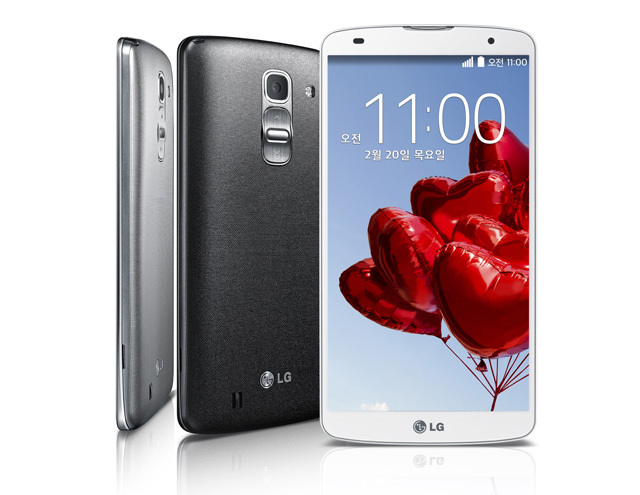 The LG G Pro 2 will be available in three colors – white, silver and titan, LG will be showing it off in MWC 2014 and although no release dates have been mentioned, the company did say they are aiming for an international launch, fingers crossed “international” means “Malaysia”. Windows Phone 8.1 - What's New?